The PNB-R elevator phone is a drop-in replacement for Rath phone units. Has a phone line monitoring feature as standard and complies with 2009 and higher ASME code requirements. 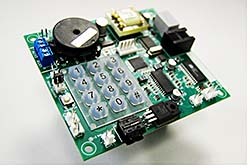 The compact board fits into the existing bracket on the back of the elevator car panel without modification, connecting to existing wiring and 24v AC/DC power.